Today is a day to take a moment and consider the sacrifices others have made. Some of them have made a choice to serve while others were drafted into service. Either way, they've taken a step many would refuse to attempt. 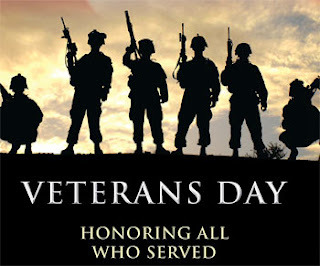 I want to honor two specific men in my life for their service for our country and the world. One is my grandfather, a WWII veteran who is currently spending his last days in hospice care. We thought we were going to lose him last week, but he's a stubborn old goat. When I was a child, I never thought about the things he had done to make my life a better one. I didn't know what part he played in the war. I'd seen the pictures of him in uniform, but I didn't have the ability to comprehend his sacrifices at that age. He was just my Grandpa. He took me to the beach to go swimming, accompanied me to museums and amusement parks, and whenever he sneezed, it sounded like he was saying "Russia! ", which made me laugh. I love him dearly, and will miss him when he is gone. I also want to honor my trainer, cover model, and friend, The Savage Trainer (TST). His reasons for joining the army as a combat medic are the epitome of honor and self sacrifice. Generosity and the desire to help others are at the core of his being, and I love him to death. To veterans, active and retired military, old and young - whatever reason you chose to walk this line, I thank you for your service. God bless.